Ahead of Tesla’s Model 3 handover event, I got to drive one – a black version with the Premium Upgrade Package. Not for long mind you: I drove it around Tesla’s Fremont factory in an extended loop on city streets, but I still got to test its mettle on some relatively long, unbroken stretches of road, push the accelerator and throw it around corners. Again, this is just first impressions – but It’s definitely the most fun I’ve ever had driving a car in this price range. A car’s interior is a weird place to start when it comes to driving impressions, but the Model 3’s is so unique that it actually contributes a lot to the overall effect of being behind the wheel. 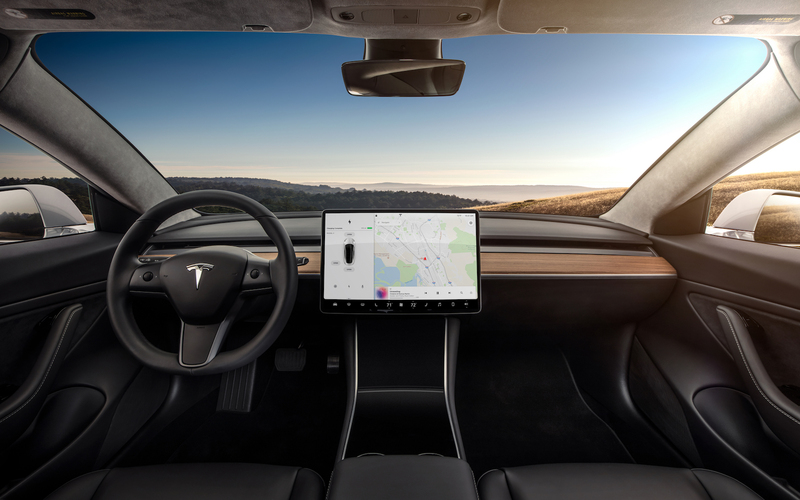 The minimalism and restraint used in coming up with the design is apparent everywhere – the center-mounted 15-inch display is basically the only eye-catching feature of the entire dash, which was otherwise broken up only by the wheel. 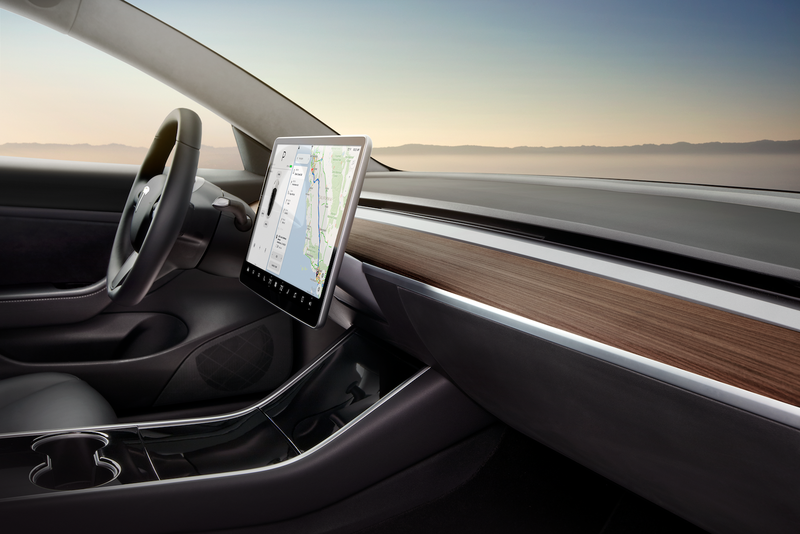 Tesla has done away with the traditional instrument panel behind the steering wheel, moving everything in terms of information, climate controls and other input mechanisms to the touchscreen. The exception is the shift column mounted just behind the wheel, and two directional scroll wheels that are inset in the wheel itself for controlling various features, including steering wheel depth and mirror position. All of this is a long way around of saying that there’s basically very little between the driver and the expansive view of the road, which takes up most of your field of view thanks to the broad, uninterrupted windshield. It’s something that says “Just. Drive.” and it’s a very pleasant experience if you even enjoy driving a little bit. The drive itself feels very much like a “Tesla” experience, with instant acceleration that gives you a thrill when you press the accelerator. It’s true that it’s not anywhere near the sensation of launching the Model S P100D, but it’s extremely fun, and will easily (very easily) exceed anything the vast majority of this car’s drivers will have ever experienced in similarly priced sedans. I really got a chance to open it up (to the upper limit of the posted speed limit, of course) in a couple of places along the route, and it felt great. Like, the kind of great where it’s nearly enough to make you giddy. And it feels like a very responsive vehicle in terms of steering, too, with a low center of gravity that results in very, very little body roll side-to-side. Resistive braking (the mode that simulates traditional brakes was off in my vehicle) is a terrific experience if you haven’t tried it yet, slowing the vehicle to a stop fairly aggressively whenever you remove your foot from the accelerator. It seemed well balanced here, and once you’re used to it you’ll never want to go back to the faux brakes feature again. It’s hard to stress how much of a step up this will be for most drivers in terms of pure driving experience: It’s basically apples to oranges. So much so that based on that brief trial alone, it’s likely my next vehicle purchase. Aside from the drive, it’s worth spending a bit more time on the cabin and interior, since it’s so unique: This version had the upgraded glass roof, which is definitely a welcome addition and helps with the overall feeling of expansive interior space. But there also just is a lot more roof in the cockpit – I’m fairly large at around 6’2″ and 200 pounds, and I tend to feel cramped in most vehicles that aren’t SUVs or trucks. Not so for the Model 3. Here’s the totally minimal front panel, including no displays beyond that large 15-inch touchscreen. This is a car that gets out of your way and lets you drive in just about every conceivable way – from overhead, and side-to-side space, to the lack of an instrument cluster, to the absence of air vents (air is circulated through slats that blend seamlessly with the dash). 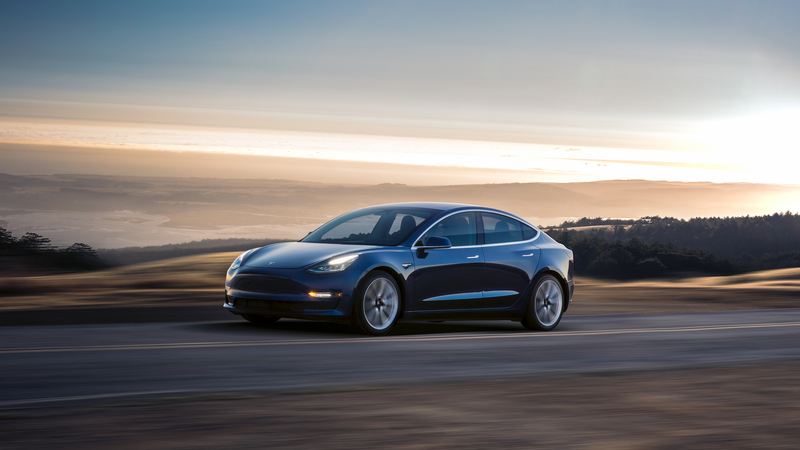 Tesla has achieved something great with the Model 3 already – they’ve created a terrific car, and one that’ll be hard to convince people not to crave to be honest. But making people want the car won’t be a problem, especially once testers are available – production is the real hurdle.